We’d love your help. Let us know what’s wrong with this preview of Girl, Arise! by Claire Swinarski. In Girl, Arise! :A Catholic Feminist’s Invitation to Live Boldly, Love Your Faith, and Change the World Swinarski points out that while both “feminism” and “Catholicism” can mean different things to different people, both feminists and Catholics desire to make the world a better, fairer place. And she shows that by treating women with dignity equal to that of men—by calling them his friends and teaching them—Jesus acted as a feminist as well. To ask other readers questions about Girl, Arise!, please sign up. Be the first to ask a question about Girl, Arise! I could not recommend this book highly enough. At approximately 100 pages it’s a quick read, but that doesn’t mean it lacks content. Claire puts into words everything that has been on my mind and in my heart for quite some time. Love Jesus and love your neighbor. Ask the Holy Spirit what that means for you at whatever stage of life you are in at this current moment because not doing anything is not an option. I think this book is 100% necessary. There is a lot of confusion about the Church and women. If you are a woman who struggles with what you read in the Bible or the way you see people acting and how it doesn’t add up to a pro woman stance I encourage you to read this book. The Church is the most pro woman institution in the world, but what high school CCD covers probably didn’t sound like that. This is a marvelous stepping stone and primer on how much the Church loves you and values you as a wom I think this book is 100% necessary. There is a lot of confusion about the Church and women. If you are a woman who struggles with what you read in the Bible or the way you see people acting and how it doesn’t add up to a pro woman stance I encourage you to read this book. The Church is the most pro woman institution in the world, but what high school CCD covers probably didn’t sound like that. This is a marvelous stepping stone and primer on how much the Church loves you and values you as a woman- not just as a wife or mother, and how much God loves and values you as a woman for the very unique and important gifts you bring to the Church no matter your walk in life. A very encouraging and empowering read. By sharing her own struggles with faith and femininity, Claire shows a way to embrace our Catholic faith and boldly live it out. Would recommend for any young woman who wants to grow but isn't always sure how to dig her way through the different opinions one sees online. After reading, I feel empowered to find my own path and stop listening to what others say I should be but listen to who God says I am. I really enjoyed reading this book. It’s a quick read, but full of important thought provoking questions and ideas for a Catholic woman who wants to live out her faith in a confused and messed up world. Claire’s writing style made me feel like I was hanging out and chatting with a smart, loving, energetic friend. I love her podcast, and hopes she writes more in the future! I’ll say first of all that I’m a man who, while disliking labels, would be thought of by the Catholic community as, well, Protestant. Claire Swinarski’s book is me trying to broaden my horizons by reading Girl, Arise! which is effectively a full on attempt at a Catholic Feminist manifesto. I say ‘full on’ because the author doesn’t mess about but jumps straight in to argue for the freeing of Catholic women from more traditional roles in the church, and, how can I put it, let them loose to effect I’ll say first of all that I’m a man who, while disliking labels, would be thought of by the Catholic community as, well, Protestant. Claire Swinarski’s book is me trying to broaden my horizons by reading Girl, Arise! which is effectively a full on attempt at a Catholic Feminist manifesto. I say ‘full on’ because the author doesn’t mess about but jumps straight in to argue for the freeing of Catholic women from more traditional roles in the church, and, how can I put it, let them loose to effect change in the world. It reads like a rallying cry to light the fires of “moxie” (energy, determination etc) in the lives of Catholic women. The trouble with lighting fires of “moxie” is that people can be swept along on a tide of emotional energy only to find this extinguished when that initial energy fades. However, I think Swinarski avoids this danger by rooting her feminist theology in the Bible with multiple examples of women in the Old and New Testaments...and in Apocryphal books Protestants would consider non-canonical. There is much to learn here if one is willing to listen. I was particularly taken with Swinarski’s way of dealing with the Apostle Paul and his frequently considered hostility towards woman. Swinarski highlights the cultural and temporal meaning of some of Paul’s views. It is a very fair reading of Paul although the author does say she’d rather deal with Job than Paul (a sentiment probably shared by many)! I found the book thoroughly engaging and would like to revisit it after the dust has settled on a first reading. Swinarski sounds a bit like a civil rights leader or a firecracker which you let loose then stand back and expect a hard hitting fireworks display (which is delivered) but that’s no bad thing. I suspect Paul would very much like Swinarski. I’ve already stated I dislike labels and while I understand the use of the phrase “Catholic feminist” I would have preferred these arguments (battle cries?) to simply come under the banner of ‘living for Jesus’. At the end of the day I don’t think Swinarski would disagree with that. Apparently the author has a podcast and I’ll be intrigued to listen to it now. Recommended reading, primarily presumably for Catholics but others traditions will benefit as well, I did. Review via NetGalley/Ave Maria Press ARC. It can be difficult to find women's spirituality novels that talk about the real stuff. Of the few I've read, most have to do with beauty and that kind of ish. Which is good and important, but I've always felt that there is so much more to being a woman. Which is why, as a listener of the Catholic Feminist podcast, I was super excited to read this novel. I had high expectations, and this book truly did not disappoint. Claire's voice is just so real; it doesn't sound like she's preaching down to y It can be difficult to find women's spirituality novels that talk about the real stuff. Of the few I've read, most have to do with beauty and that kind of ish. Which is good and important, but I've always felt that there is so much more to being a woman. Which is why, as a listener of the Catholic Feminist podcast, I was super excited to read this novel. I had high expectations, and this book truly did not disappoint. Claire's voice is just so real; it doesn't sound like she's preaching down to you, but rather simply talking to you. Matter-of-fact, practical, and slightly snarky, Claire provides wisdom that draws from Catholic, biblical truth and personal experience. Personally, I have found it difficult to reconcile feminism with my Catholic faith. Plus, from having conversations with secular feminists, I've always found myself frustrated and sort of torn between feminism and faith. I wanted to march at the Women's March, but I also wanted to support life. I wanted to be feminist, but I also wanted to recognize that women are not exactly the same as men. If you've ever questioned how a Catholic could be a feminist, then this book is perfect for you. While it is a bit more tailored toward Catholic Women, it is perfect for any young adult Catholic who is trying to find their voice in this world while staying true to the faith. As a young adult woman in the 21st century, I observe from the sidelines how people argue about what is right and i too have been burned by the word Feminist. To me, it's a negative word almost akin to a curse word. In Girl, A If you've ever questioned how a Catholic could be a feminist, then this book is perfect for you. While it is a bit more tailored toward Catholic Women, it is perfect for any young adult Catholic who is trying to find their voice in this world while staying true to the faith. In Girl, Arise!, Claire Swinarski visits different traits and ways where to be Catholic in of itself is to be a Feminist. From how being Pro-Life is being Pro-Women to Loving JOY (Jesus, Others & Yourself). Claire's voice is clear and evident in every passage. 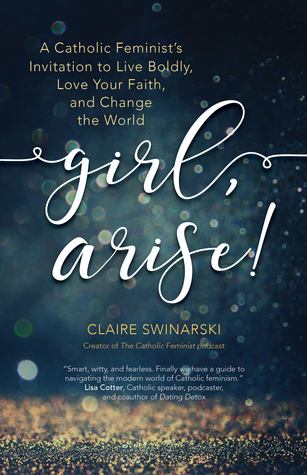 If you've listened to any episode of The Catholic Feminist Podcast, you already know Claire's voice and Girl, Arise is an extension of that all around combining our beautiful Catholic Faith with being a true Catholic Feminist in our modern world where we are told day in and day out to be Catholic AND a Feminist is impossible. I was pleasantly surprised at how much I enjoyed this book. I was even more pleasantly surprised how much I learned. As a fan of the Catholic Feminist Podcast, I was not sure if I would gain that much more in reading the book since I feel like much of the content gets discussed on the show. However, it was refreshing to hear everything from Claire's perspective and learn about the theology and philosophy that drives her faith and her feminism. Excellent book! This is a book for all seasons and for any woman. Having a similar background to the author (FOCUS missionary, mother of babies, desirous to make disciples in my right now) this book spoke to me and challenged me to pick one thing that God has put on my heart and run with it. Thank you, Claire for these words and putting your heart into this book! All women will benefit from reading this. And it’s extremely quick! There just isn’t much in here. Yes, it can be seen as a contradiction to be a Catholic and a feminist but some of these points could be made in a blog post and not repeated for over 100 pages. Maybe I’m a bit older than her intended audience. Sometimes this felt juvenile to me. And her repetition of “for the love” got on my nerves. Some good points are made (loving your neighbor, caring for everyone) but these could be made in a few pages. I never realized I’d been waiting for someone to write this book until I read Girl Arise. Claire Swinarski beautifully articulates the way so many women in the catholic church define “feminism”. Her voice is very conversational and at times I wanted more depth, but most of the time I felt like I was having a soul-warming chat with a good friend, and that’s a good thing. Highly recommend! A friend found this book and suggested it as for a Lenten Book Club of sorts and we are ALL loving it. This is a book for all of us who feel pretty left out at most eomen's retreats; those of us that went to college Catholic centers and left wanting more, those of us who sat through endless, pointless modesty talks. This book is incresible! A wonderful book!! Just what I needed. I'll re-read it soon, I want to take notes to understand it better. The book helped me to understand where I stand in this wide spectrum of feminist, catholic women. Obviosuly, I didn't agree with everything that was written, but in general it was a very interesting point of view. We are daughters of God!! Every woman should read this. Every priest should read this. I’m not a twenty something, but this book breathed life into SO many things I feel and struggle with in the church. Excellent. My daughters will definitely be reading this book. I love so much that Claire is not afraid of being completely honest with her opinions which leads to being a little “sweary” and enraged. Not only did she speak out loud the truth I’ve personally felt, but she also gave some beautiful parting thoughts to more fully engage my next steps. A quick read that is wonderfully inspiring and challenges me to live my faith more boldly! This book brings a needed discussion to the forefront - how can we as Catholic women step into our God-given potential to further the good of those around us. I was particularly struck by Claire’s words at the end about acknowledging the fear of “adding to the noise” rather than a productive conversation. I love the podcast and the book made a lot of good points. My only critique is that it wasn't long enough. I feel like once I finally started getting into it, it ended. I loved this book! Claire spoke straight to my heart, and made me look at some issues in a new light. I can’t recommend this enough. I’ll definitely read this again. God Bless Claire for writing this book. It is exactly what I needed. What we all needed. I am an avid listener of her podcast, but this is a tangible resource that I will go back to again and again. The book that speaks all I could have ever hope to say, but better. It's a good book with a decent message. It's just written very much from the perspective of a middle to upper middle class white woman.